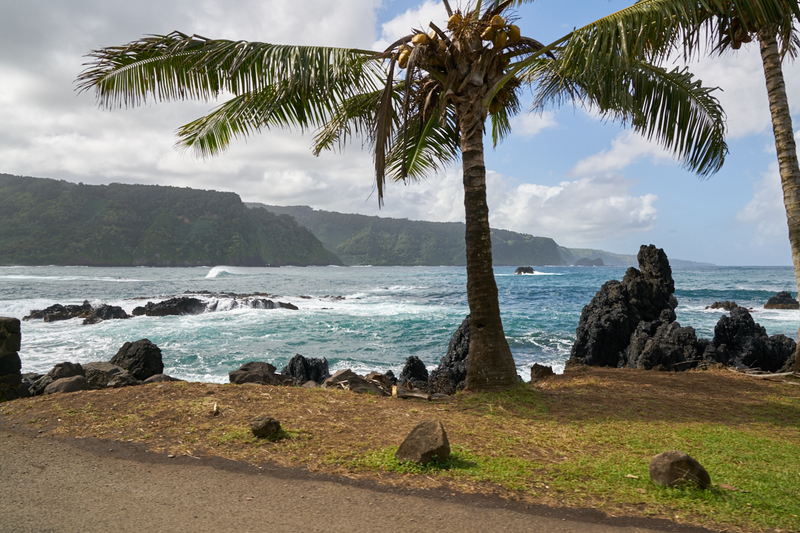 We left our hotel in Kaanapali and headed toward a small town on the east coast of Maui called Hana. 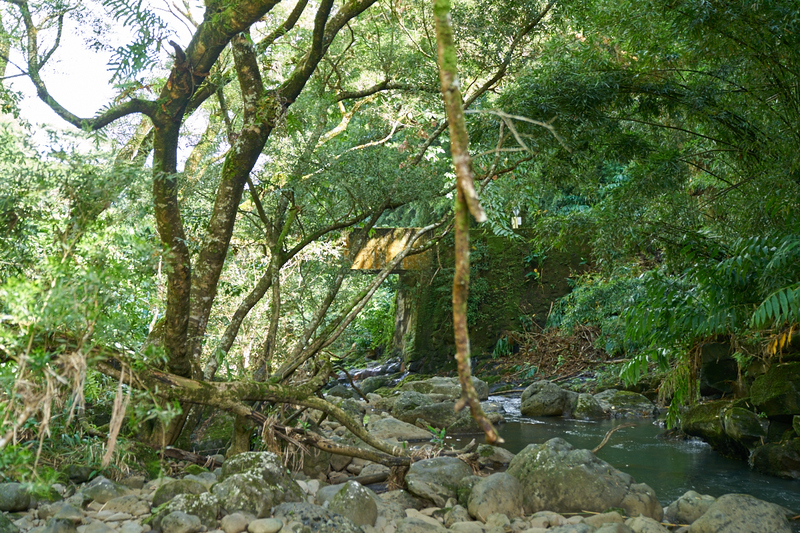 The road to Hana is very narrow with plenty of one lane bridges. 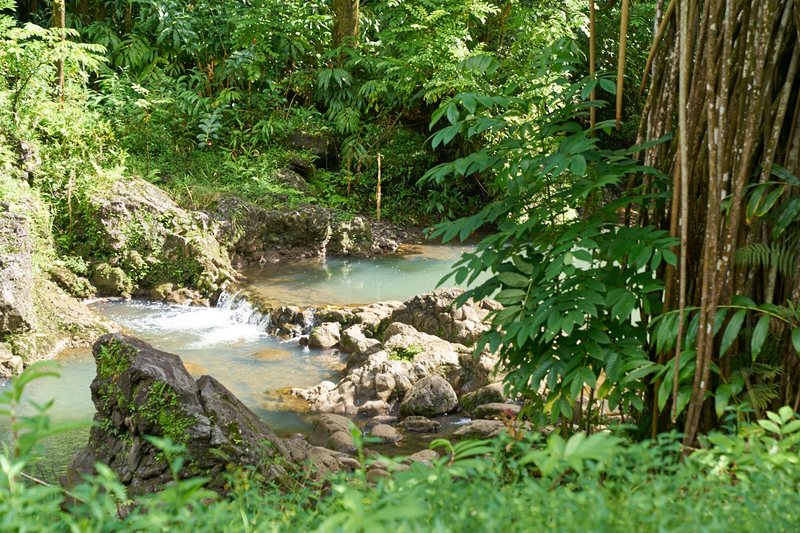 For the most part, the road follows steep cliffs through the jungle with only occasional views of the water. 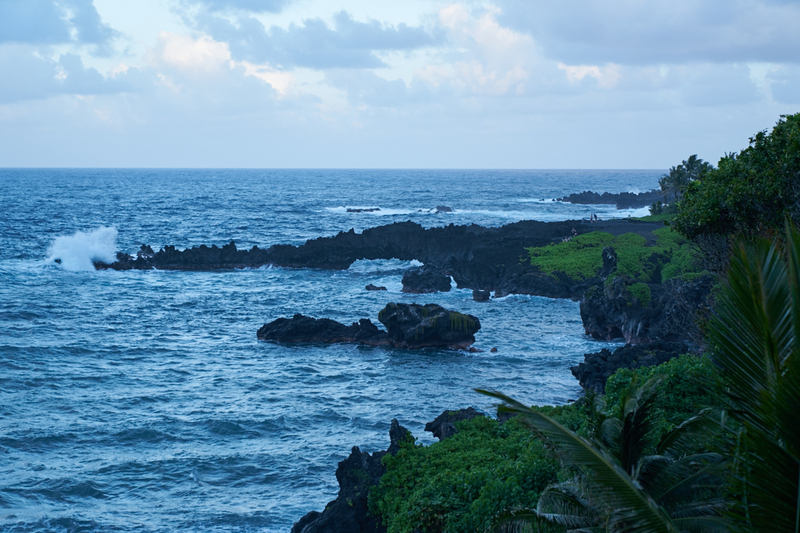 Popular lore states that there are over 600 turns in the road from the Maui isthmus to Hana. 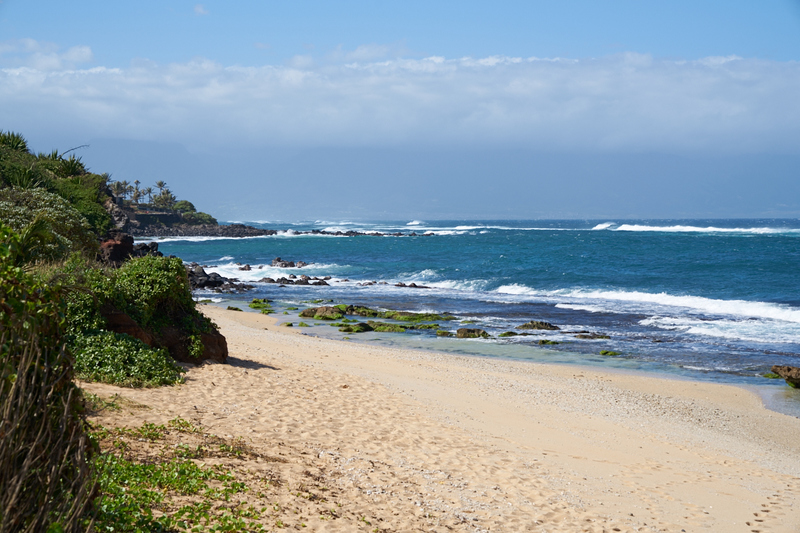 Still on the isthmus, we came upon a turnout that allowed views of the north shore surf. 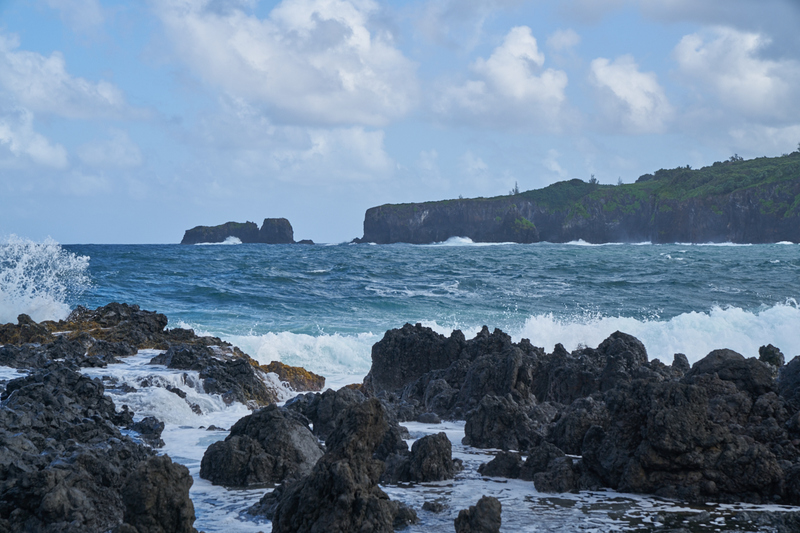 The north side of the island gets much bigger waves due to its proximity to the Gulf of Alaska which is the nursery for large Pacific storms, particularly in the winter months. 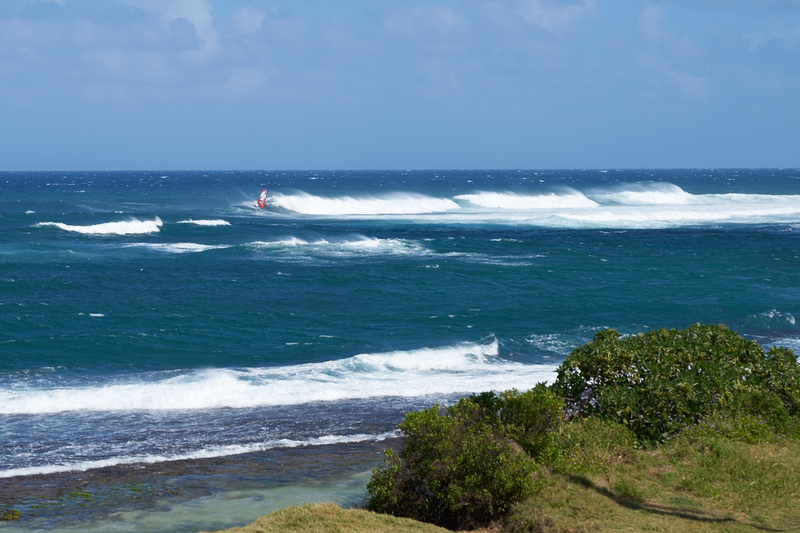 Strong trade winds combined with high surf conditions draws wind surfers. 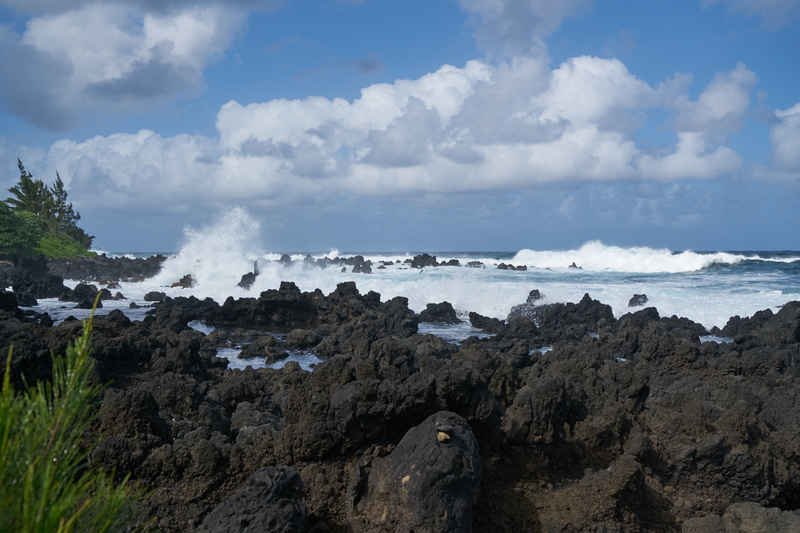 The reef just off shore provided an area for boogie boarders. The road left the beach areas and started a climb up the cliffs into the jungle. 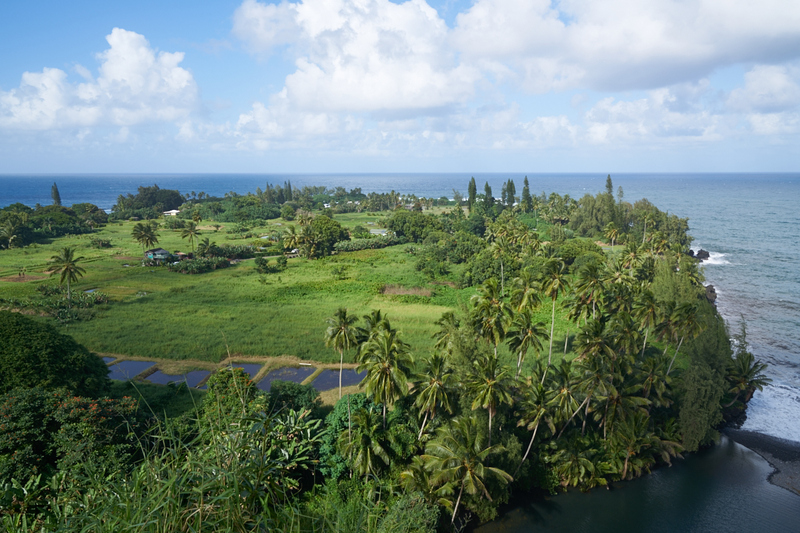 The road was built in 1928 and provided land access to the locals to areas that were otherwise only accessible via boat. 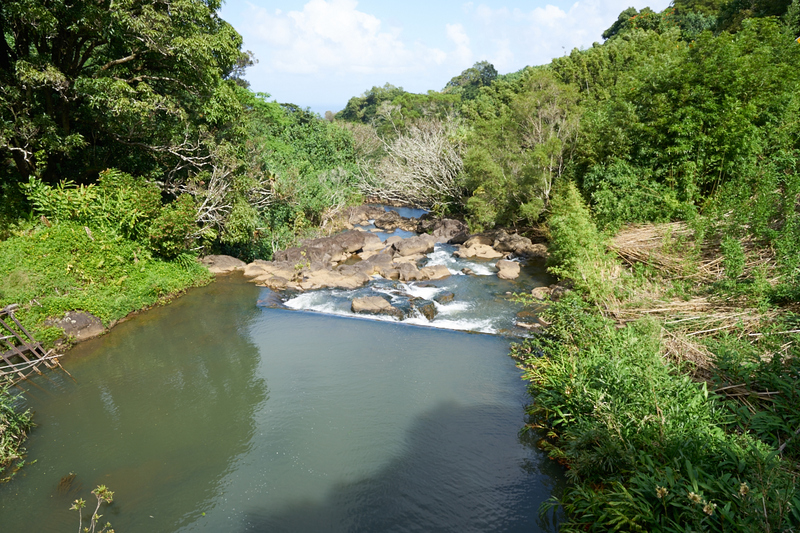 The early sugar cane plantation owners created a canal system to divert jungle runoff on the north side to the dry south side. 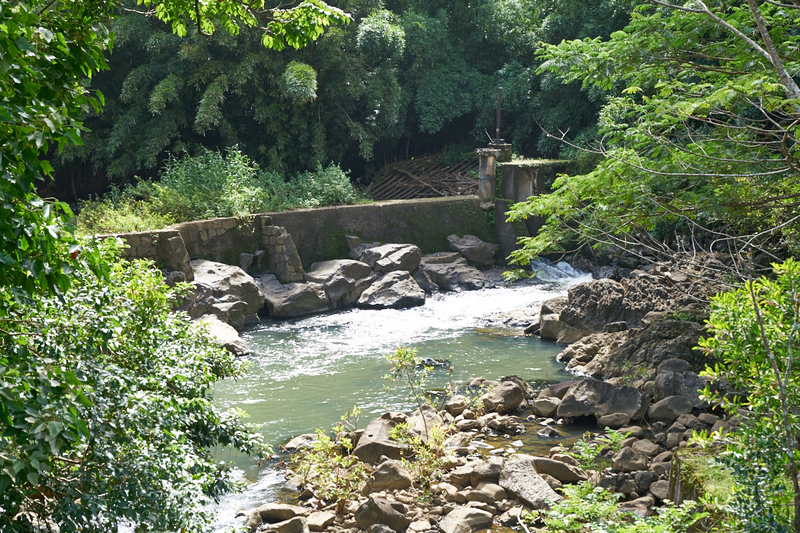 Above, the remains of a weir can be seen. 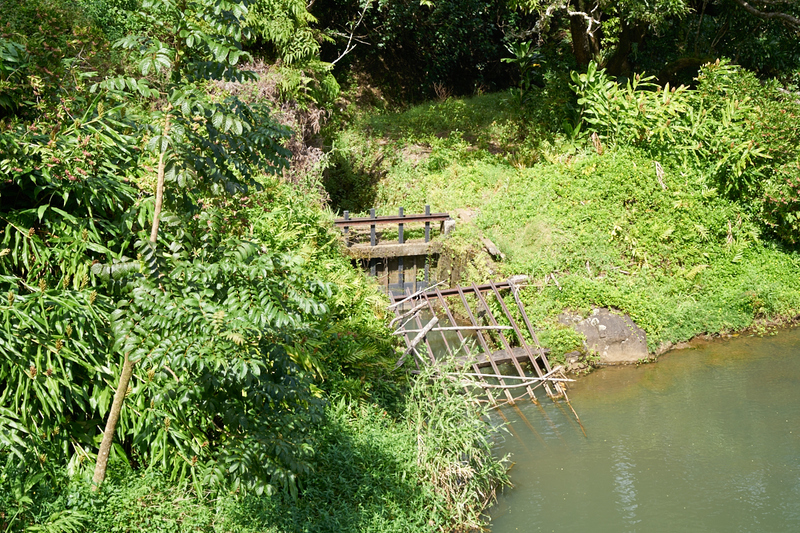 A small check dam had been built to pool water for entry to the canal weir. Construction of the canal infrastructure was a huge project back "in the day" due to the remoteness of the area. Further up the road we came upon a small waterfall. While dismounted at the waterfall, a look in the opposite direction showed the river channel and the concrete bridge for the road. 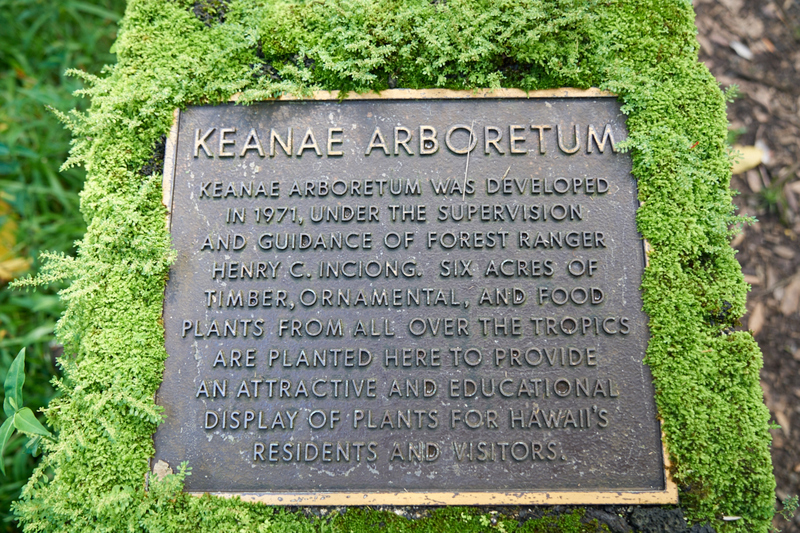 The road went past the Keanae Aboretum. The plaque in the photo above tells the story. 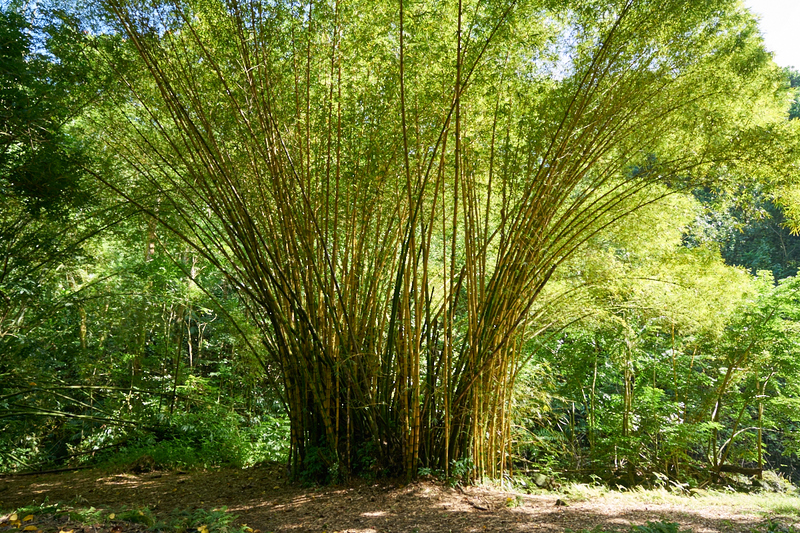 A stand of bamboo at the aboretum. 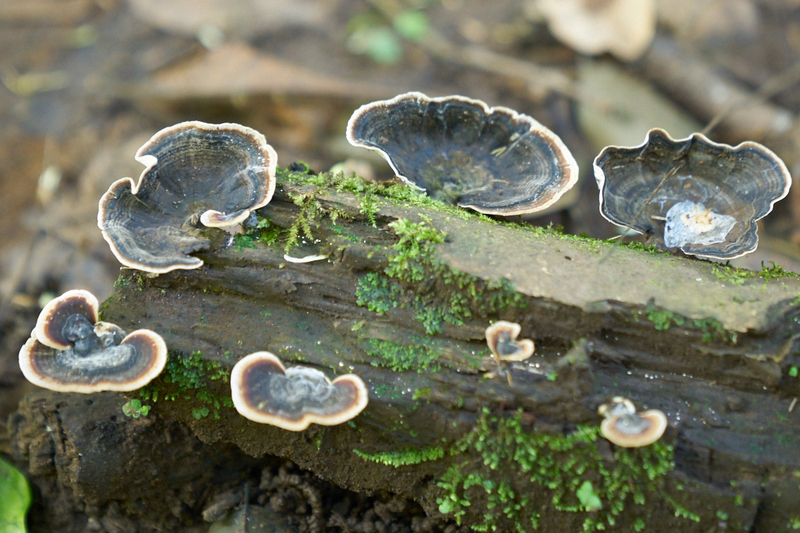 The jungle wetness supports all manner of plant life including this odd fungus. 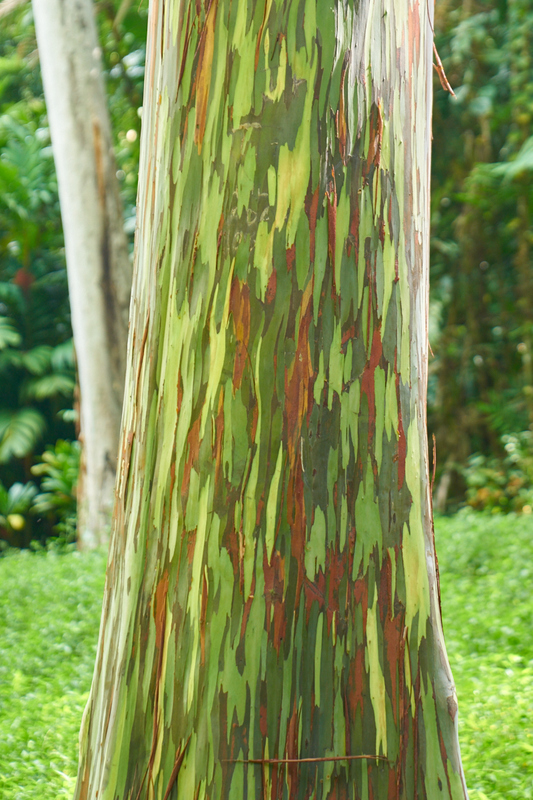 There were a number of specimens of Rainbow Eucalyptus trees. 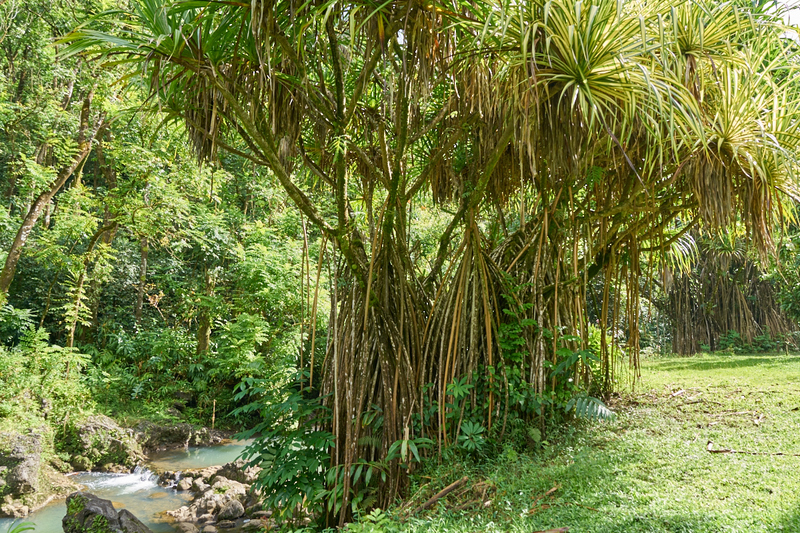 In the jungle, the fight for survival centers on access to bright sunlight. 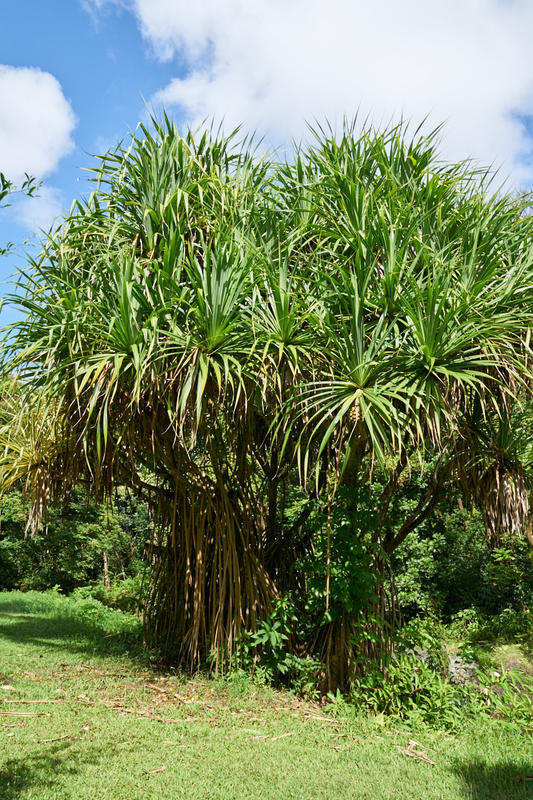 Plants that have robust structure, like big trees, are used as a free ride to the sunlight. 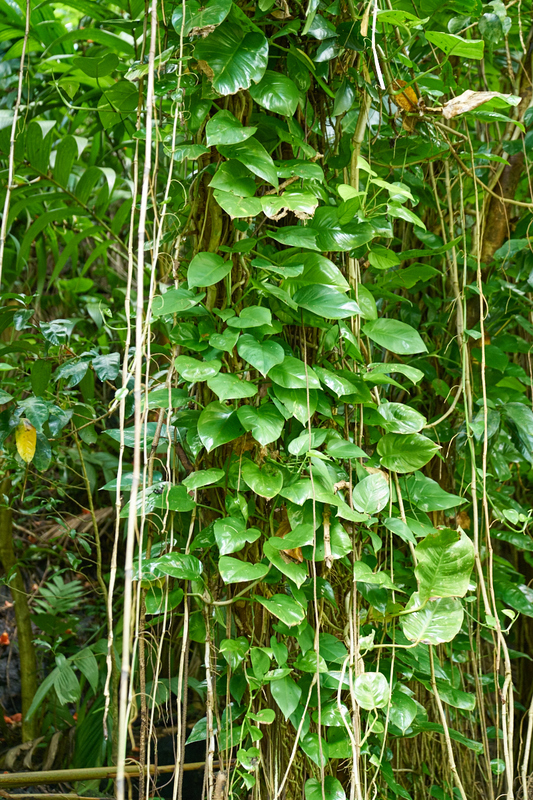 Vines and creeping plants cover ever tree. I should have noted the name of this plant, but the multi-part root structure is unique. 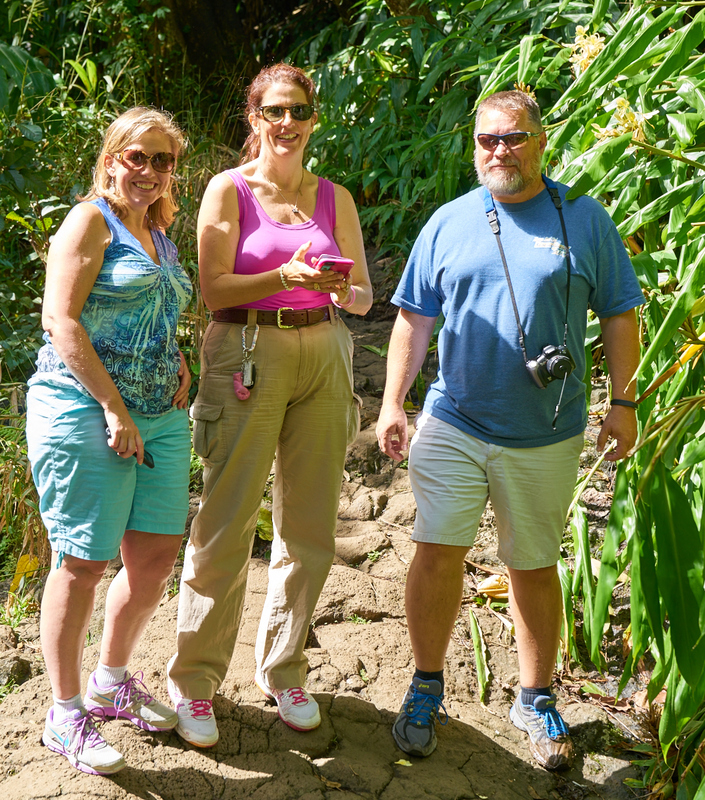 There were many pools in the stream that flows through the arboretum. Another specimen of the multi-part root plant. The road wound its way down the cliffs to the ocean which gave us a view across one of the small bays. 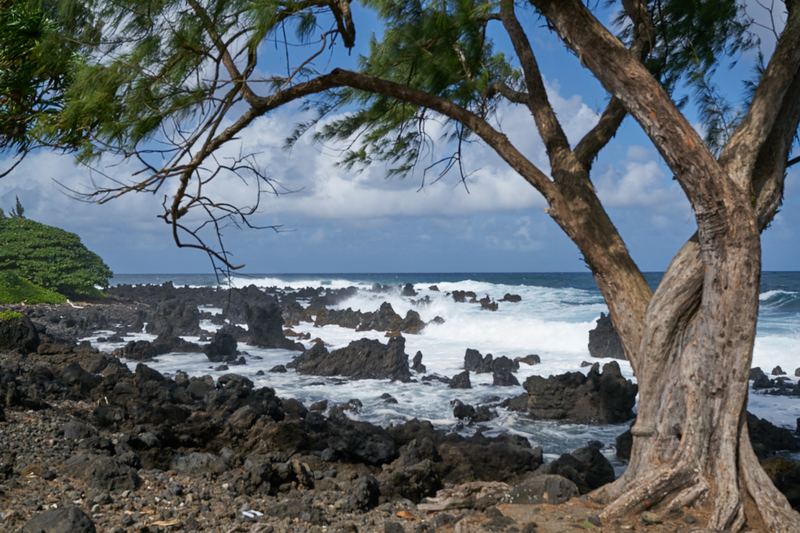 The shoreline on the north side was very rugged with volcanic rocks stretching into the surf making swimming here out of the question. You would be cut to ribbons by the sharp rocks. 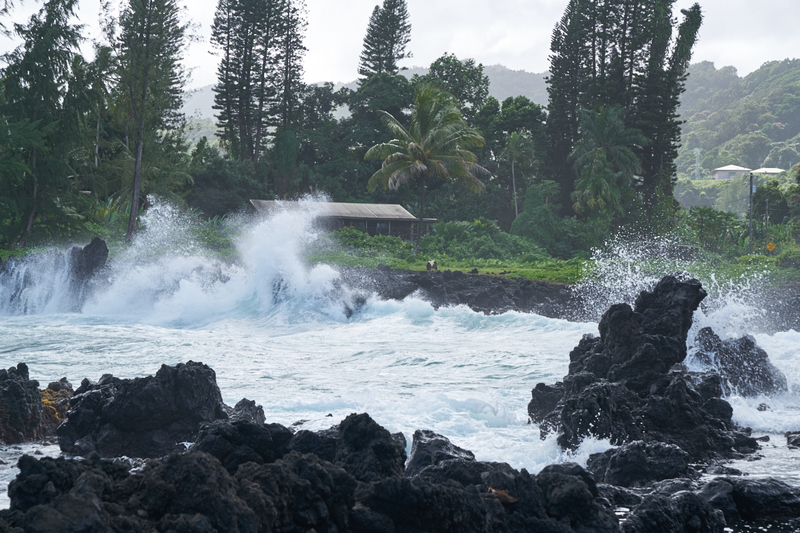 The large waves crashed on the sharp rocks sending huge clouds of spume into the air. There was a small ranch right on the edge of the surf. Note the miniature horse in the center of the photo above. 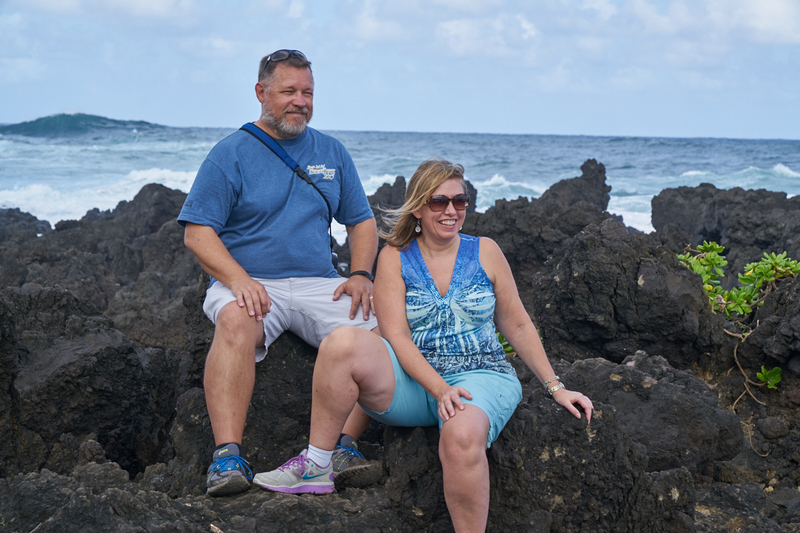 Craig and Stephanie pause for a photo on the jagged lava rocks. The headlands to the east would have presented a daunting obstacle to anyone wanting to land a boat on the shore. The road resumed the climb up the cliffs giving a view of the taro ponds in the clearings below. 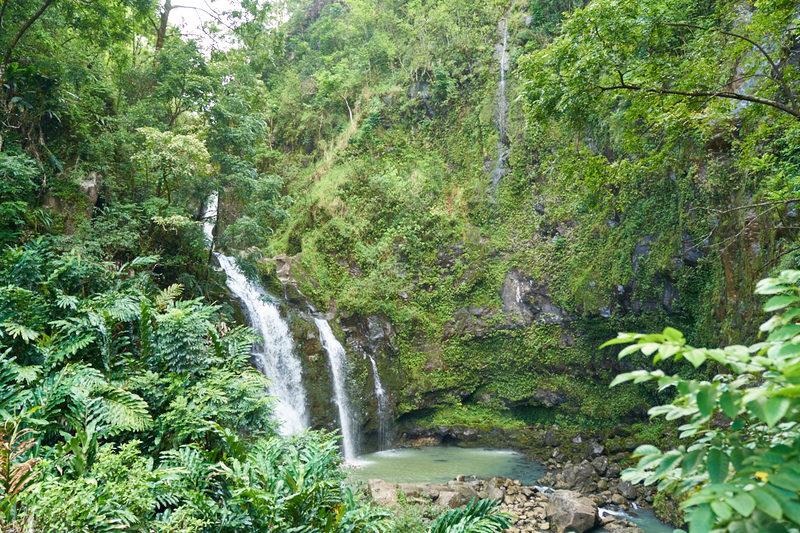 The road passed a triple falls with a small pool at the base. 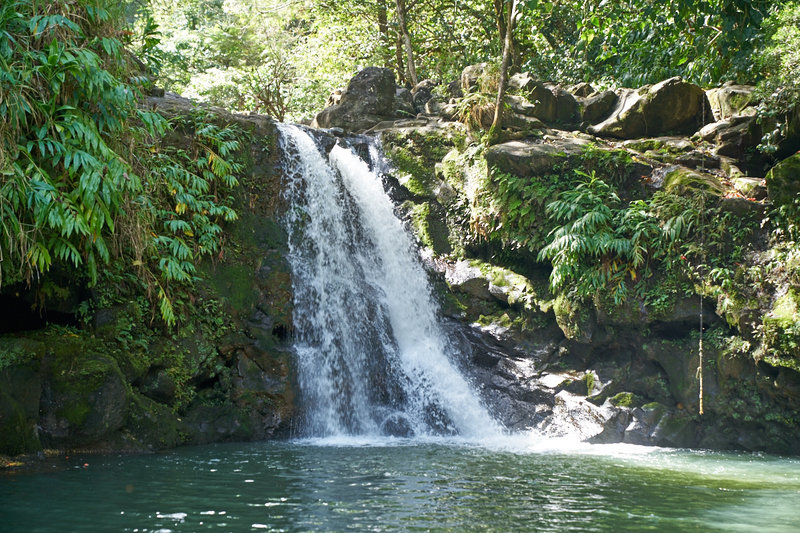 Due to the viewpoint, these falls seem much smaller than they really are; the largest being 70 feet high. 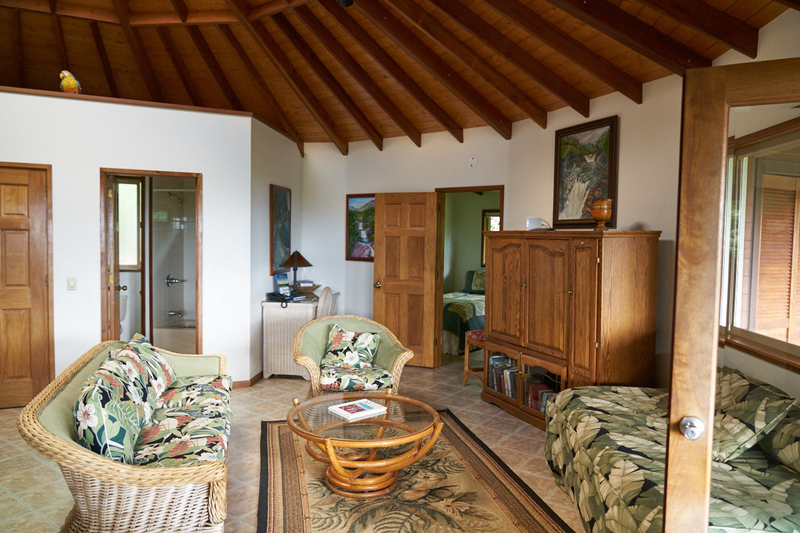 Craig and Stephanie had a place reserved on the north side of Hana. The rental had plenty of space, although the sleeping areas were small (cozy is the term that is currently in vogue I think...). 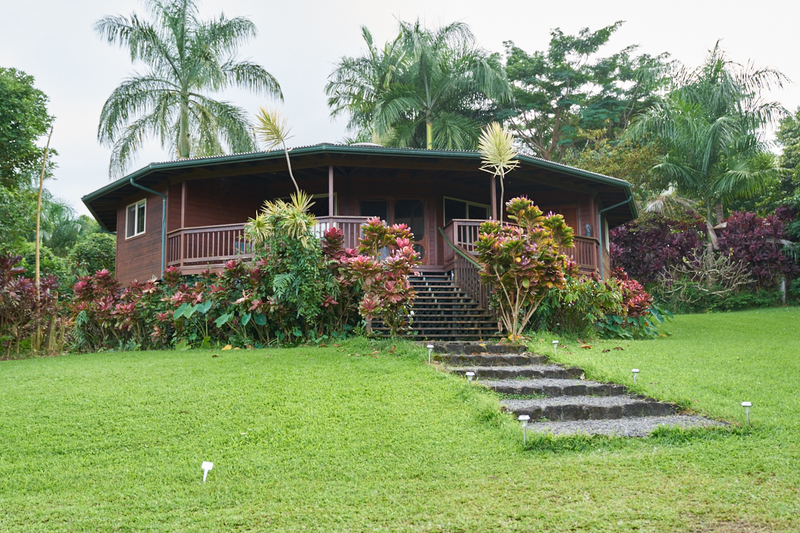 The place had what we needed and was close to "central" Hana. I am sure that this rental produces a nice revenue stream for the owner. 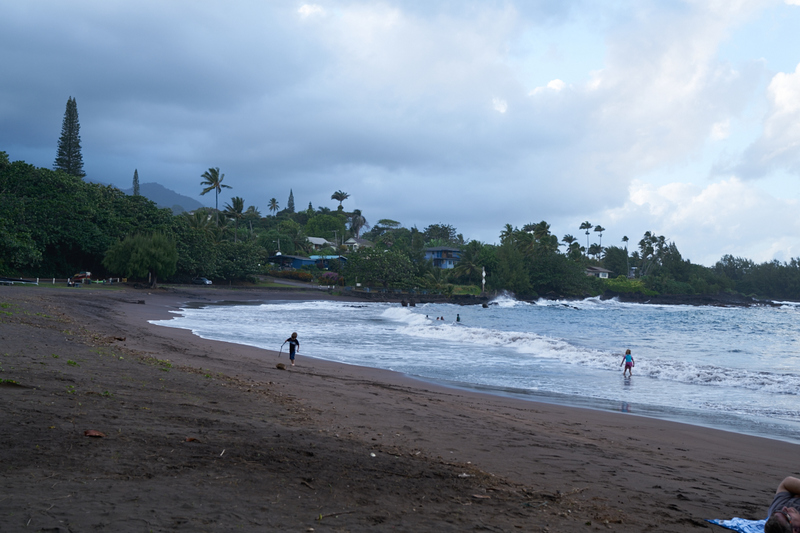 Despite being near sunset, we headed to the beach to attempt snorkeling. The water was rough and the waves were churning up the water preventing good visibility. Kathleen tries here boogie board. 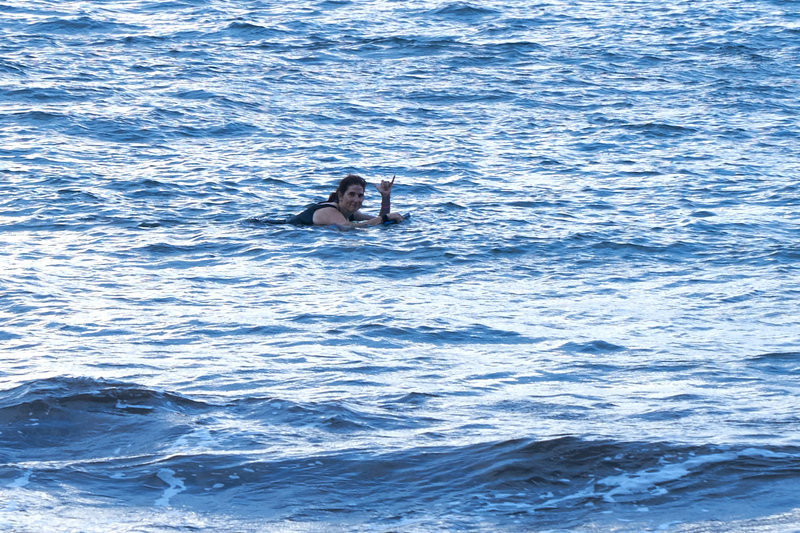 Only Kathleen was brave enough to get into the water. After she got out, we headed north to the state park for a view of the sea arch which was just barely visible in the waning light. We went back to the apartment to clean up and then we headed to Travaasa Hana Hotel for dinner. The food was excellent and we were all very pleased. 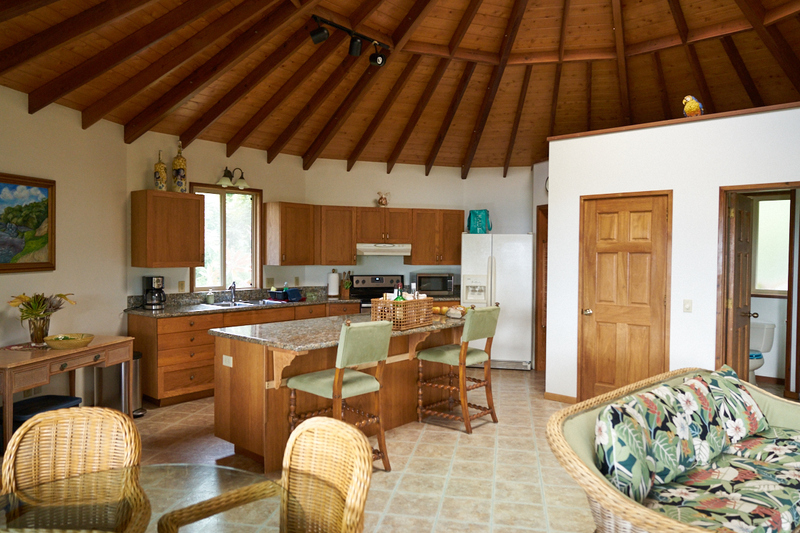 The apartment was rented for only one night so next day, we loaded up and headed back towards Kaanapali along the south road.